Review of Avery/Russian River Collaboration Not Litigation Ale | Beer Apprentice - Craft Beer News, Reviews, Interviews and Info. Hello everyone. 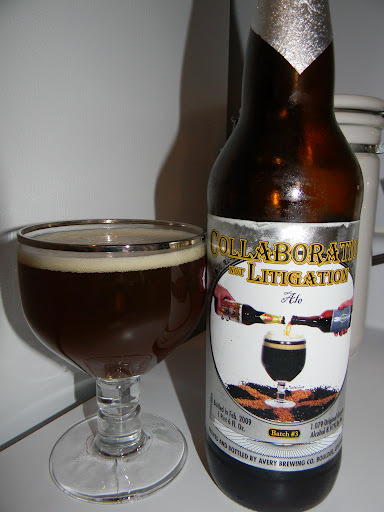 For today’s craft beer review I’m going to be trying the Collaboration Not Litigation Ale produced by the Avery Brewing Company located in Boulder, Colorado and the Russian River Brewing Company located in Santa Rosa, California. This beer was batch #3 bottled in February, 2009. I found a cool little back story of how this concoction was devised from the website, averybrewing.com. Natalie, Vinnie’s much more significant other, exclaimed, “We should call this Collaboration, not Litigation Ale!” “Perfect,” we shouted! We celebrated deep into the night (or is that morning?). Fast forward to November 14, 2006. After talking about it for over two years, we finally decided to pull the trigger and Vinnie made the journey to Avery Brewing to brew his Salvation exactly as he does in his brewery. Let’s see how it is, shall we? This beverage comes in a 22 oz. bottle and has an ABV of 8.97%. It poured a considerably hazy, deep ruby red to burgundy color with an off white crown. The head was kind of small in size, somewhat soapy and frothy. The retention time was slight as was the lacing. I did see a few clear alcohol legs hanging on the sides of the chalice when tilted however. The bouquet brought out a nice dose of dark cherries and raisins. It also had a slight grape juice like quality. Some bready and yeasty characteristics with just a touch clove. Deeper in the nose some sugary caramel malt became evident. Not a bad fragrance at all. Well balanced and suitable. The taste provided a touch of tartness from the dark fruits. Cherries and grapes mostly. A decent burst of alcohol was tasted, however it seemed to mellow and become more harmonious as the brew warmed. A solid amount of spice from the clove really meshed well with the yeast. It even began to develop some toasted bread snippets. Like the aroma, the caramel sweetness didn’t begin to be established until after it opened up a touch. The mouthfeel was medium bodied, although it was a little thinner than I thought it might be. Very dry, chewy and smooth. A low amount of carbonation was to be had. A sturdy shot of warmth was felt and a nice amount of flavor was left behind on the palate after each sip. Well, I think we have a very solid beer here with plenty of complexity to ponder. The drinkability was comfortable, however it’s best taken in small sips in my opinion. Definitely worth a try if you are able to obtain a bottle. I would really be interested in seeing how other vintages compare to this one. I think it would be an excellent companion on a cool Fall evening. I’ll probably try to procure another bottle once the crisp days start arriving. So with that being said, if you guys have had the Avery/Russion River Collaboration Not Litigation Ale, I would be interested in hearing what you thought. Thanks for checking in on another review guys. I really appreciate it.